By GolfSpy MBP, April 22, 2014 in Everything Else! There's so much fantastic going on in that image I don't know where to begin. Now if I had that there would be triple the gallery. Freaking awesome - I love it. They are sitting at the bottom of the Potomac. Lynx golf is apparently still a thing. I even peeped their new irons and they look pretty visually appealing. â€‹I'm posting this because whoever runs their twitter account is CLUELESS lol. 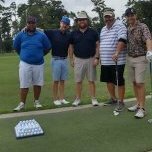 Most of yall are probably aware of the No Laying Up guys and maybe the Club Pro Guy on twitter. They are hilarious accounts. Well Lynx doesn't think much of them and won't even play along with jokes about it despite both having HUGE twitter followings and Lynx having less than 4k.